There are several pieces of the book that go after the main body of the cookbook, these are called "back matter". They include content like an index, glossary, appendixes, bibliography, or resources. 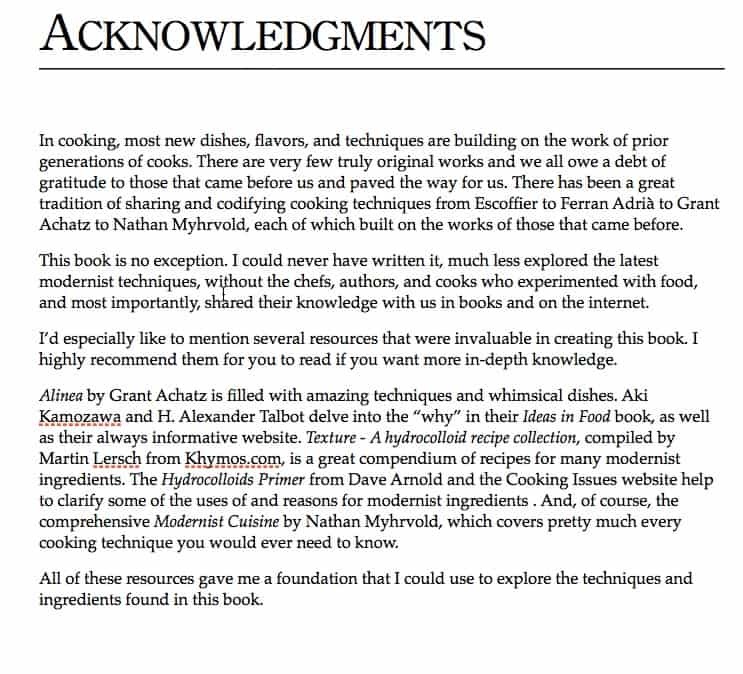 All of this content is optional, though an index and resources section are very common in cookbooks. 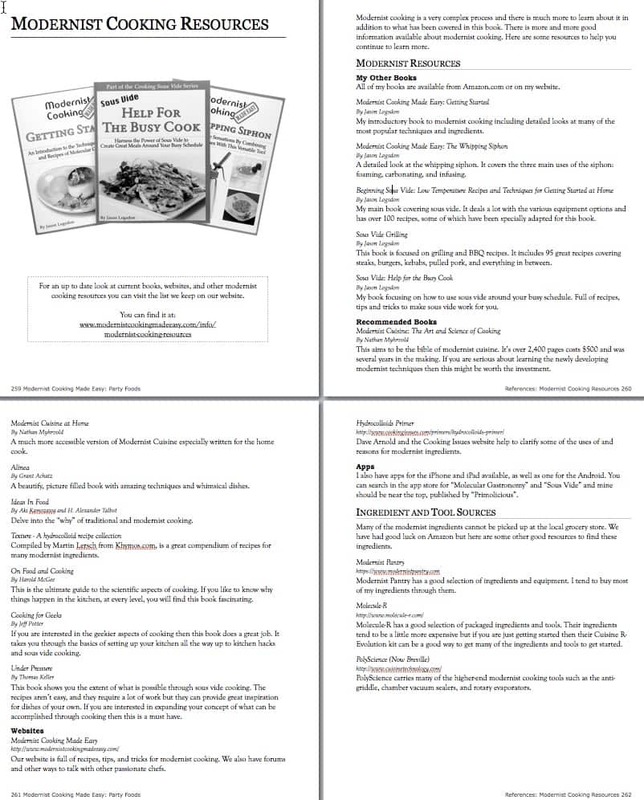 Descriptions of the various pieces of back matter are provided below with basic examples, but for more examples pull a few of your favorite cookbooks off the shelf and look at how they handle the back matter. 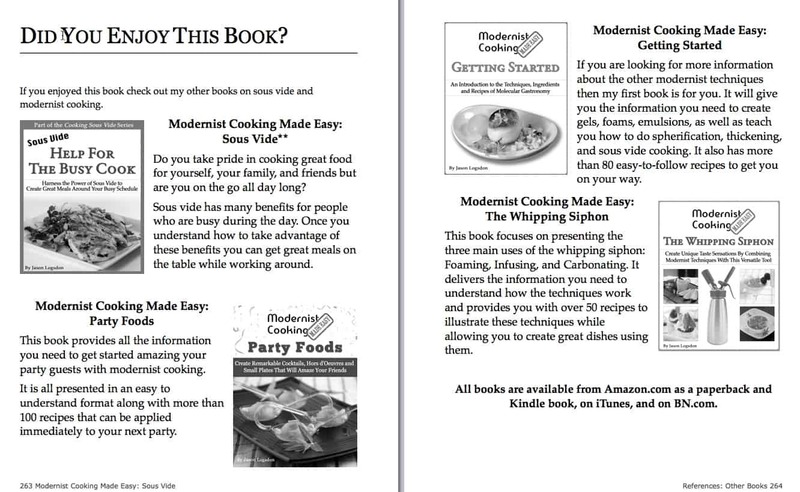 You can also download a sample of the back matter from my book, Modernist Cooking Made Easy: Party Foods for an example of the order and spacing. The index is a listing of key words and where they appear in the text of your book. It is a very important part of a cookbook because readers are often trying to find that one recipe they vaugely remember, or because they have chicken in the fridge and want to see all your chicken recipes. There are many ways to choose the words that go into the index, though trying to think what groupings a user would be most interested in is a good place to start. Often times the index focuses on main ingredients like types of vegetables or proteins. More specific books might focus on other distinctions, such as types of grains in a baking book, or fillings in a pie book. 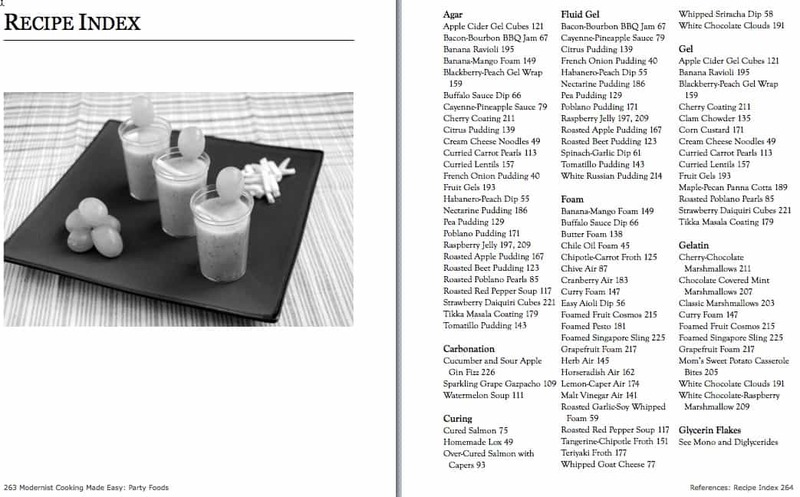 Because my books are about modernist cooking or sous vide, I tend to focus my index around modernist techniques (gelling, foaming), modernist ingredients (agar, xanthan gum), and main protein types (beef, chicken). I've found those breakdowns to be enough to give readers a good idea of where specific content is. And if you don't think having an index is important, in the one book I published without one, I got more negative reviews about lacking an index than I did for printing in black and white. If you use any ingredients that are hard to find in a small grocery store? Suggest some good online retailers. Do you mention a technique but don't go into more details? Point out some books or websites with more information. Is any specialized gear used in your recipes? Give the reader a few sources they can purchase it. Are there any companion books, websites, or apps? Alert your reader to them. The appendix will consist of any tables and charts or extended information that doesn't fit directly into the text of the book. This is a great way to provide summarized information in one easy to find location. It is also a valid place to put more technical descriptions of things you mention in passing in your actual book text. I use the appendix a lot in my books. 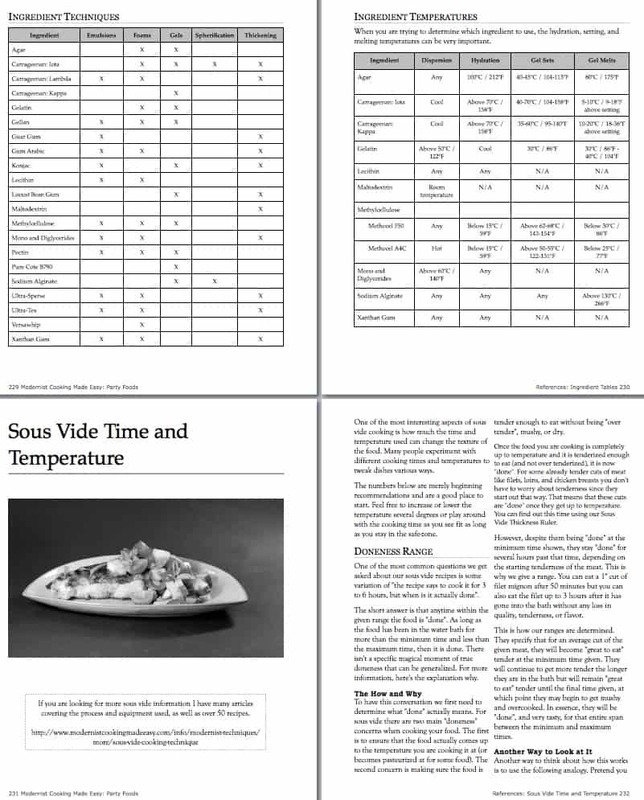 I always provide tables of time and temperatures combinations for sous vide items, ratios for modernist ingredients, and other data-heavy things. 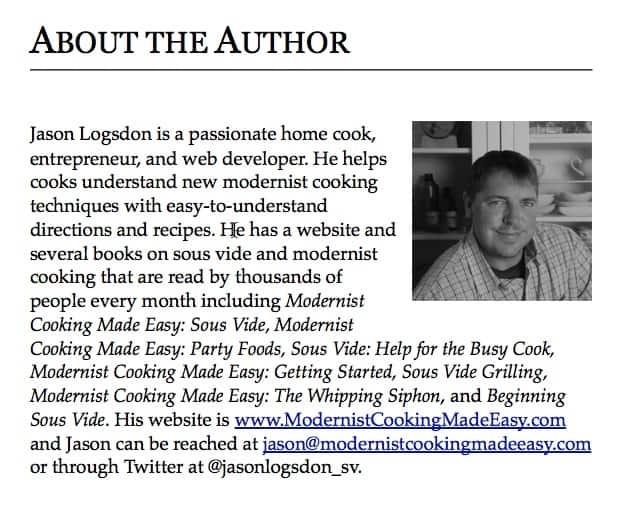 I also provide essays on topics that don't work in the flow of the text, such as discussing time vs tenderness cooking in sous vide, addressing modernist misconceptions, and other more detailed topics. The glossary is a place where you can provide definitions for terms you use elsewhere in the book. This can be very helpful if you assume your readers have a base of knowledge but worry that some people won't know every term you use. Instead of describing it within the text of the book you can add it to the glossary so your readers know they can turn there for any additional information they may need. If you heavily rely on other people's work then a bibliography is key to give them credit. It is a list of sources you used for your book, citing the author, title, publisher and date. Some people prefer to remove some of the information for a topic and display it in an end notes at the end of the book. (You can also display them on the same page as foot notes). 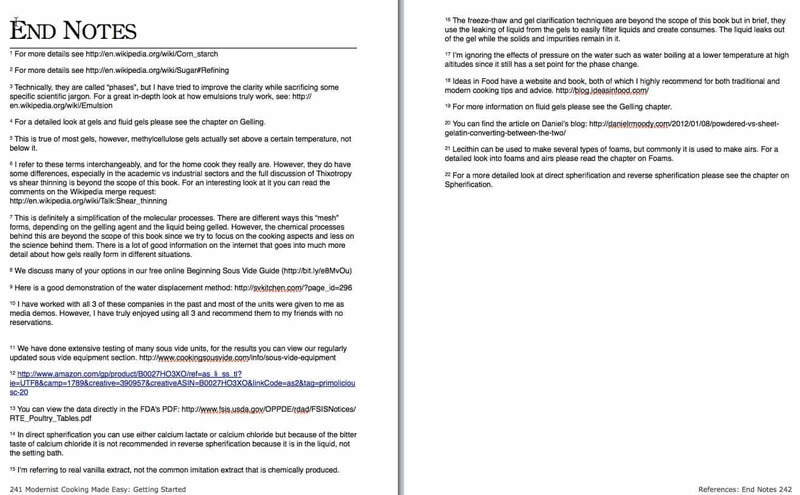 The end note is commonly used to point to a citation of the source of some material, provide a website link to the topic, or provide a more detailed aside from the author. The end of the book is a great place to highlight your other books. If the reader has gotten that far, they most likely enjoyed your work and would potentially be interested in other books you have written. If you don't have any other books, you can also use this space to highlight your blog. I try to market 2 or 4 of my other books on a nicely laid out page with covers of the books prominently displayed. This lets readers see the books and better sells them on the content. Acknowledging the people who have helped you with the book can be done at the front or end of the book and is a great way to give thanks to the community of people who has helped you. This could be anyone who helped edit, outline, or otherwise assist with the creation of your book or other authors or cooks whose work you greatly leaned on. Providing more information about yourself is a great way to build trust with your readers. This section usually consists of 2 to 4 sentences about the author, followed by a listing of their most prominent books, articles, or websites. There is often a way to contact the author directly, either through email, Facebook, or Twitter.